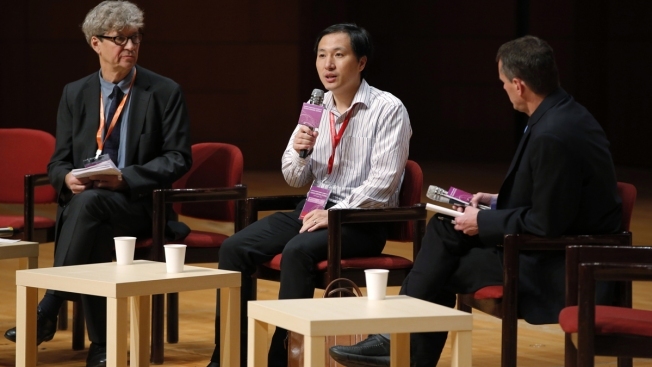 He Jiankui, a Chinese researcher, center, speaks during the Human Genome Editing Conference in Hong Kong, Wednesday, Nov. 28, 2018. He made his first public comments about his claim to have helped make the world's first gene-edited babies. A Chinese researcher who claims to have helped make the world's first genetically edited babies says a second pregnancy may be underway. The researcher, He Jiankui of Shenzhen, revealed the possible pregnancy Wednesday while making his first public comments about his controversial work at an international conference in Hong Kong. The second potential pregnancy is in a very early stage and needs more time to be monitored to see if it will last, He said. According to the scientist, twin girls were born this month with altered DNA. Leading scientists said there are now even more reasons to worry, and more questions than answers, after He's talk. The leader of the conference called the experiment "irresponsible" and evidence that the scientific community had failed to regulate itself to prevent premature efforts to alter DNA. Altering DNA before or at the time of conception is highly controversial because the changes can be inherited and might harm other genes. It's banned in some countries including the United States except for lab research. "They need this protection since a vaccine is not available," He said. "This is a truly unacceptable development," said Jennifer Doudna, a University of California-Berkeley scientist and one of the inventors of the CRISPR gene-editing tool that He said he used. "I'm grateful that he appeared today, but I don't think that we heard answers. We still need to understand the motivation for this." Doudna is paid by the Howard Hughes Medical Institute, which also supports AP's Health & Science Department. "I feel more disturbed now," said David Liu of Harvard and MIT's Broad Institute, and inventor of a variation of the gene-editing tool. "It's an appalling example of what not to do about a promising technology that has great potential to benefit society. I hope it never happens again." There is no independent confirmation of He's claim and he has not yet published in any scientific journal where it would be vetted by experts. At the conference, He failed or refused to answer many questions including who paid for his work, how he ensured that participants understood potential risks and benefits, and why he kept his work secret until after it was done. After He spoke, David Baltimore, a Nobel laureate from the California Institute of Technology and a leader of the conference, said He's work "would still be considered irresponsible" because it did not meet criteria many scientists agreed on several years ago before gene editing could be considered. "I personally don't think that it was medically necessary. The choice of the diseases that we heard discussions about earlier today are much more pressing" than trying to prevent HIV infection this way, Baltimore said. The case shows "there has been a failure of self-regulation by the scientific community" and said the conference committee would meet and issue a statement on Thursday about the future of the field, Baltimore said. Before He's talk, Dr. George Daley, Harvard Medical School's dean and one of the conference organizers, warned against a backlash to gene editing because of He's experiment. Just because the first case may have been a misstep "should in no way, I think, lead us to stick our heads in the sand and not consider the very, very positive aspects that could come forth by a more responsible pathway," Daley said. "Scientists who go rogue ... it carries a deep, deep cost to the scientific community," Daley said. The National Health Commission has ordered local officials in Guangdong province to investigate He's actions, and his employer, Southern University of Science and Technology of China, is investigating as well. On Tuesday, Qui Renzong of the Chinese Academy of Social Science criticized the decision to let He speak at the conference, saying the claim "should not be on our agenda" until it has been reviewed by independent experts. Whether He violated reproductive medicine laws in China has been unclear; Qui contends that it did, but said, "the problem is, there's no penalty." He called on the United Nations to convene a meeting to discuss heritable gene editing to promote international agreement on when it might be OK.
Dr. Matthew Porteus, a genetics researcher at Stanford University, where He did postdoctoral research, said He told him in February that he intended to try human gene editing. Porteus said he discouraged He and told him "that it was irresponsible, that he could risk the entire field of gene editing by doing this in a cavalier fashion." Dr. William Hurlbut, a Stanford ethicist, said he has "spent many hours" talking with He over the last two years about situations where gene editing might be appropriate. "I knew his early work. I knew where he was heading," Hurlbut said. When he saw He four or five weeks ago, He did not say he had tried or achieved pregnancy with edited embryos but "I strongly suspected" it, Hurlbut said. "I disagree with the notion of stepping out of the general consensus of the scientific community," Hurlbut said. If the science is not considered ready or safe enough, "it's going to create misunderstanding, discordance and distrust."